Museum and Learning Center on Petroleum Her Royal Highness Princess Maha Chakri Sirindhorn presided over the opening of the "Museum and Learning Center on petroleum. Department of Energy, "on January 20, 2553. 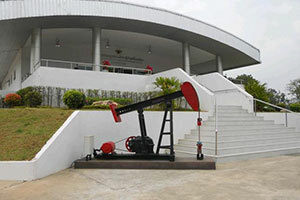 To provide a source for studying the history of exploration, drilling, production and refining of petroleum by Thailand. The history of natural resources in the country. As well as of the affairs of Northern Petroleum Development Center, or "Boh namman Fang". This is the first oil field in Thailand. The museum is open every day except holidays working days from 09.00 - 16.00. Saturday - Sunday. And holidays 09.00 - 15.00. Visitors can contact the group states. In a letter to the Director of Northern Petroleum Development Center. Ministry of Defence No. 173 Moo 2 Tambon Mae Kha Fang district, Chiang Mai 50110.